"Welcome, You have opened the doors to the pleasures of Heaven & Hell, to the further regions of experience, where pain and pleasure are indivisible." These spine-chilling words great us as we open a rather different kind of box than the one featured in Clive Barker's dark film, none other than the collector's boxset "The Chronicles" containing the complete and remastered scores to all first three Hellraiser films. Whereas previous incarnations of these scores exist independently (but are notoriously difficult to acquire), the boxset delivers the goods without senseless bonus tracks with music from another movie, provides a FAR superior sound rendering and is as complete as could be. In summary, the "editions" contained within the box are the only ones that do proper justice to the music itself. Despite the fair amount of original modern horror scores before Hellraiser (such as Joseph Loduca's Evil Dead for instance), Young's music would single-handedly change people's perception as to what a horror film score should "sound like". In a time during which most composers were either using Herrmann's Psycho as a building block or creating unsatisfying sythesized mush, Young infused a new and profoudly romantic character to the proceedings. Many people use the word "gothic" to describe Hellraiser's sound but that ultimately proves too conservative. In fact, there are numerous elements to the music of Hellraiser, from baroque sensibilities and neoromanticism to atonal music, that all converge into an experience far more satisfying than -let's say- Danny Elfman's more traditionally gothic orchestrations. While I mention Elfman, it may be useful to quickly dispel a recurring myth that I frequently come across on the Internet and even among established press: Christopher Young was NOT inspired or did NOT copy the music from Elfman's Batman. To seal this silly matter once and for all, both Hellraiser and Hellbound were released earlier than Batman. 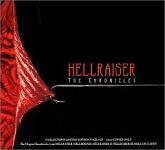 The main Hellraiser theme has become an integral part of horror lore. Simply named "Hellraiser" on the tracklist, it slowly creeps into life with icy yet beautiful strings. It isn't long before the whole swirls into a dramatic burst of brass instruments, prefigurative of the Batman theme and its very similar layout. Of special mention is the wondrous work of conductor Paul Francis Witt as well as the various people responsable for the recording and remastering at work here. The booklet's mentionning of "rich symphonics" doesn't come anywhere near describing how marvellous Christopher Young's music sounds when it comes pouring out of a decent sound system. Silva Screen Records can certainly pat themselves on the back for this one. Tracks "Resurrection" and "Re-Resurrection" are essentially variations on the main theme, although they take things to entirely new and exciting heights. The indrocution of piano to the proceedings is a stroke of genius by Young, giving a whole new meaning to the term "dance macabre". In fact the result is so startling that, to this day, many people still believe "Resurrection" to be the film's main theme. "Hellbound Heart" -incidently the original name given to Clive Barker's short story upon which the film was based- is an epic 5-minute sweaping romance...dark romance that is. The music chronicles the burning desires of Julia's character as she is haunted by delightful visions of her past affair with the evil Frank. The orchestra's violins gently built the tension up from subtle contemplation to a soaring climax, perfectly capturing the sexual nature of the scene. Both "The Lament Configuration" and "The Cenobites" mark a descent into Barker's cold labyrinthian Hell of leather-clad tormentors and swaying chains. The cenobites themselves are usually signaled by austere gong-like bells, perhaps as to accompany the priestly austerity of Pinhead and his minions. In these tracks, Young also manages to pull off some of the most Alien sounding atmospherics I have ever heard. It would be wrong to call these simple "effects" though; there is a fierce intelligence behind the composition, as with all quality experimental music. "Hellbound: Hellraiser II" literally erupts into life with its dramatic main title. The elements that made up the first main theme are all present, but are now accompanied by powerful whirling choir voices. Prepare to be blown away...big time! "Second Sight Seance" is a nostalgic trip back to the world of the first Hellraiser, in which the brass instruments give way to the gentle yet foreboding swaying strings and singing clarinet, before introducing some beautiful variations of Hellbound's main theme. Most tracks on Hellbound operate like a montage of distinct moments. It is unclear wether these were re-arranged in this way for the release or originally scored and then edited to fit the film's narrative; what is clear though is that it works like a charm. The best example of this can be found in "Looking Through a Woman", scoring Julia's resurrection, an encounter with the Cenobites and a scene involving Leviathan's "dark light". Kicking off with tribal drums, dizzying atonal voices and a commanding succession of double bass and contrabasson, this is Young at his most exhilirating. Further down the line, dissonant strings pave the way for the mechanical pounding of what sounds like a timpani; the latter effect is used to score a series of flashbacks in the minds of those under the gaze of Levianthan. While it is true that Young's Hellbound is more theatrical and bombastic than the first Hellraiser, it is also far more experimental when it comes to tracks such as "Stringing the Puppet" and "Chemical Entertainment". Here, all manner of Cenobite-type atmospherics are gloriously manipulated and the resulting effect is truly spectacular. There is a kind of rumbling in the background -reminiscent of Angelo Badalamenti's music for the David Lynch films- upon which pitched voices come about and fade away as ripples on the surface of water. "Hall of Mirrors" is yet another example of Young's twisted genius. I must warn those of you out there who suffer from coulrophobia (fear of clowns), you may want to skip this one...As Young's circus fanfare of trumpets marches in, the effect achieved is far from comical. The fanfare grows darker and darker still as the individual notes are pitched and the satanical bells, swaying chains and black mass chanting of Hell closes in. For an alternative take on this particular score, check out our review for Hellbound: Hellraiser 2. 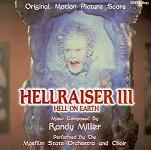 Hellraiser III: Hell on Earth plays out very differently than the first two scores, partially because of the more commercial nature of the film, but mostly because of Randy Miller's clever refusal to emulate the original Christopher Young music. The "gothic" label that was inappropriately ascribed to the first Hellraiser films becomes a more acceptable way of describing the overall sound palette here. Hell on Earth ends up sounding like a mixture between Alan Silvestri's Predator and Danny Elfman's Edward Scissorhands, with clever referencial nodes to Christopher Young along the way. The main theme is as brazen as it gets. Gone are the quivering romances of the first score and the operatic outbursts of the second; instead, a frenzy of marching strings establish the quasi-actioneer feeling of the third film while piercing brass notes soar menacingly above them. A minute or so into the first track, dark choir voices also make an appearance but never quite live up to those of Hellbound. Argueably, one could make the point that the two primary aspects of Hell on Earth are established through the main theme alone, and that the following ten tracks consist of intricate variations on these. There are some stand-out moments though, such as "Cenobites' Death Dance", with its subtle and waltzy take on the Hellraiser theme. This little funeral valse of sorts clearly outshines the rest of the score. Whereas it may be true that the third installement doesn't quite live up to the first two, this boxset is worth acquiring solely for Young's remastered work in any case. In my humble opinion, Hellraiser and Hellbound are right up there with some of the most sublime horror scores ever, including Pyscho, The Omen and Alien (Bernard Herrmann, Jerry Goldsmith). Even for those of you who are put off by the graphic nature of the films themselves, don't let this stop you from enjoying these masterpieces.